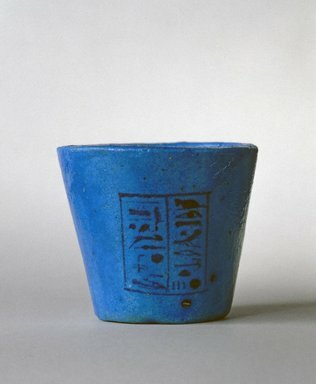 Small faience cup with brilliant blue glaze. Hieroglyph inscription in dark blue, probably manganese, contained in a two column oblong. The inscription proclaims it to the property of Nesi-Khonsu. The entire inscription reads” Osiris, the Chief of the Great Harem Women of Amon-Re, Nesi-Khonsu”. Condition, there are ancient defects in firing, otherwise perfect.